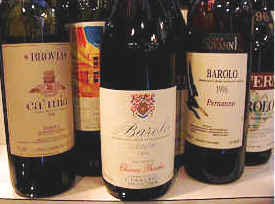 The 1996 vintage is regarded by most Barolo producers as a "classic" vintage. The resulting wines have about as much color as wine made from Nebbiolo has a right to have. The wines are fairly tannic and seem to have enough "stuffing" for cellaring. We put a group of eight wines to "the test." Gerald found "ripe fruit with plum and prune...jammy notes with anise...medium-bodied, this is moderately tannic, with the same disturbingly jammy notes on the palate. My preference is for more fruit and less jam, so I would advise buying (and gambling)." Some wine writers (Gambero Rosso in Italy gave this a 3-Bicchiere, their highest, rating) liked this one but the tasters tonight were less taken by it. One found a flaw he couldnt quite put his finger on, over-ripe fruit with a trace of kerosene perhaps? Another taster thought that the winemaker avoided the current fashion for new oak, using old-fashioned large old oak ovals. Another was put off by a note of cherry cough-drop while another complained that the fruit didnt develop in the glass. Bob found it a bit shrill with an almost treacle edge. There was ripe fruit (plums and even berries), sweet oak with traces of tar and green leaf. It was admittedly dry with secure acid and fair tannins but the fruit seemed uncentered or perhaps lacking a center." Gerald's notes described this as having "bright, sweet cherry fruit with a hint of vanillin....the fragrance reminds of a cherry (kirsch) eau-de-vie. Medium-full bodied, it's very aggressively tannic...truly "old style" Barolo with a bit of nice fruit...Big, rich, ripe and tough...needs 10-20 years!" One taster decried the brutal tannins but another quipped theres enough fruit to keep the tannin company. Another liked the depth of black cherry fruit while another found funk, greens, menthol and cherries. Gerald found "...a lovely nose with ripe berries and sweet oak and vanillin underneath. Medium+ in body, this is big, rich, ripe, tannic, astringent Barolo with good structure for 10+ years of cellaring. A hint of cinnamon is evident on the palate, too." Several tasters found bitter tannins, high acid and insufficient fruit, throwing the wine out of balance. Another found a bit of funk at first which faded but left a sharply acidic, metallic edge to the wine. Someone else had was put off by what they perceived as a "vinegar note on the palate." Bob was more enthusiastic finding deep, ripe fruit with a Pinot-like edge to it. On the palate it had a relatively easy entry, nicely lean with an accent of sweet oak and spice. Concentration of fruit seemed to indicate aging for about 5 years. Gerald noted this as being "...an old style Barolo with high-toned cherry fruit...a shade of a sharp, SO2 note...This is fairly full on the palate, though tannic and requiring patience." 4th Place: MICHELE CHIARLO "CEREQUIO"
Gerald described this as having "berryish fruit, with a touch of cherry...a faintly woodsy note with hints of rosemary in the background...fairly big, yet not well-filled out. I felt this has more tannin and 'grip' than real depth or intensity of fruit. In any case, it's pretty good Barolo, needing 8-15 more years of cellaring." 3rd Place: E. PIRA di Chiara Boschis "CANNUBI"
For one taster in particular this wine was a major thrill: Killer wine! Gorgeous with dark toast, lots of fruit, tannin and OAK! It was generally admitted to be a nice example of the new international style. If you like oak, its a wonderful wine. Another noted the prevalence of wood tannins and the strong vanillin characteristic of American oak. One taster described this as being more like "...California Cabernet, not Barolo!" Gerald found "...tarry, woodsy and sharply oaked notes, being almost resinous. It seemed to become more sweet over the course of the tasting. The wood is a bit crude on the palate, showing some green notes. Tannic, big and typically-structured Barolo." 2nd Place: GIANNI VOERZIO "LA SERRA"
This wine was much liked by the group, one taster finding sweet black fruits, cassis and mocha on the nose with plenty of fruit and balance on the palate. Something in it makes me suspect that there was a bit of Cabernet blended in. (Cabernet, Merlot or Syrah are not officially accepted for blending into DOC Barolo, though many producers planted these a few years ago thinking the law would change to allow a small percentage of "other" varieties). 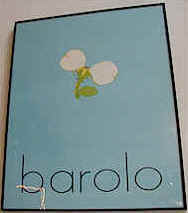 Another taster found that it lacked a distinct Barolo character. Bob also found a certain Cab-like or Merlot-like thing. But primarily there was nice easy, spicy, nicely ripe Nebbiolo fruit with hints of mint and Angelica root although the nose seemed to close down a bit in the glass. Heres a big, tannic, high-acid wine with structure, depth, length and excellent concentration. At least 10 years further development in store." Gerald described this as having "Sweet vanillin notes and a hint of truffle and cocoa...sweet fragrances all the way along...the palate is classically 'Barolo,' showing a bit of dried rose with fairly aggressive tannins. It needs ten to 20 years of cellaring, though it's attractive now." 1st Place: MICHELE CHIARLO "CANNUBI"
One taster was put off by a leathery, barnyardy element while another found a chemical note and far too austere a wine. But most of the tasters were enthusiastic, finding great mouth-feel, lots of new oak and a great, long finish. One person found some "black pepper notes with the best and most lengthy finish." "Another excellent wine." commented one fellow. Gerald found "...deep, sweet perfumes, ripe berries and lots of vanillin. Very nice nose...tannic and young on the palate, it's another 'classic' Barolo, being big, bold and brawny. Ten to 20 years would be about right."